These are wonderful Diane, I especially like your "Integument" and "Statue of Liberty" and yes, one big rat has done some severe damage, keep'm coming! Thanks, Michelle. 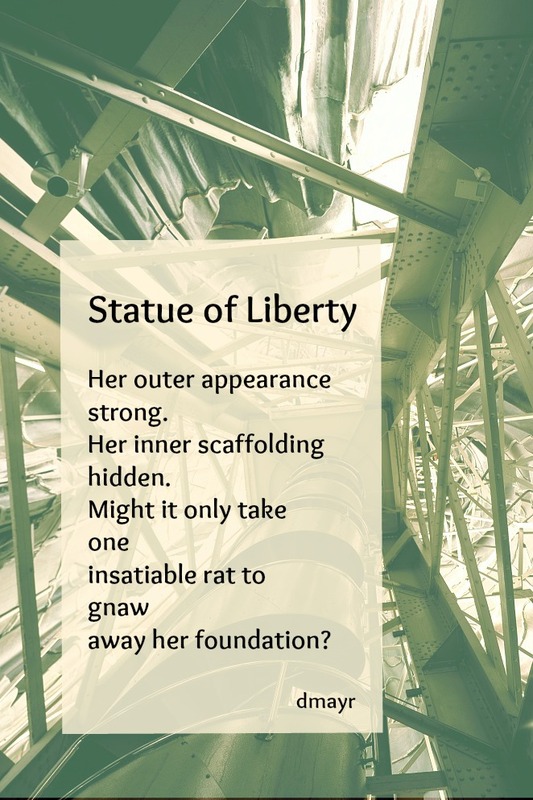 Statue of Liberty was written out of frustration that so much damage could be done by one rather insignificant individual. Each one with your outrage, yet that final one touches me to the core, that "insatiable rat" we must confront again and again. Don't stop! I think I'm going to have to stop. I hate being angry all the time. Oh wow Diane. Poetry is a wonderful way to express your outrage, and to cut to the core of the problems. Thanks for sharing and hugs to you. I will definitely take all the hugs I can get! I love that you didn't shy away from the hard and ugly truth of our nation and the irony of Lady Liberty at this moment in our national history. I had relatives who came to this country and saw the Statue at the end of their trip. I can't imagine making a trip only to be greeted by armed agents and metal pens. These poems are hard and true. I have not been able to express my disgust in such an eloquent way. The Statue must thank you for saying the words she can't say. I did laugh at this line, "Can't he not see the woman isn't white, but green." 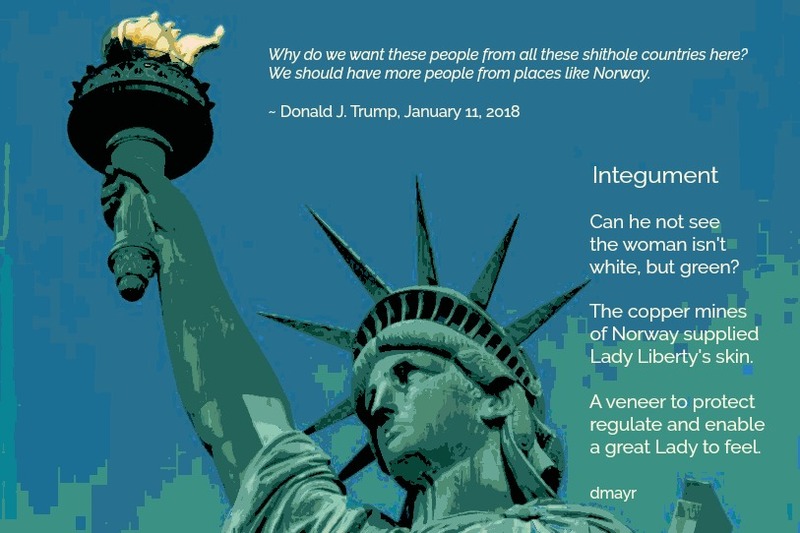 I recently found an article that stated the original prototype of the estatue portrayed a black woman and that it was rejected. The sculptor ended up using his mother as a model. Why hadn't I heard this story before? I love this series. I'm also angry. A callous rat has been gnawing at my productivity, filling my days with outrage and anger. A steady diet of chaos isn't good for anyone who prefers to put the pieces together into art. It is so tiring being outraged and continuously angry. I have to return to the days of writing poems about flowers! I am hugely appreciative for the potency of these poems matched with images, Diane. Sending good vibes to you, for moments of joy, interspersed with the angst + action so many of us are involved with since the cascade of downward diving direction for our great USA. The only action of any consequence is VOTING! These poems ring so sad and so true. No safe harbor here indeed. It's hard not to either feel despair or tune out...November's election will hopefully be a first step in the right direction. It's going to be the longest three months ever! Indeed, I'm sure it is very difficult to continue standing there on watch...Lady Liberty's job is much harder these days. Thanks for sharing these. And yet, those of us on the sidelines MUST continue acting as witnesses. Thank you for celebrating what our Liberty Lady stands for. She is working overtime to keep the rat at bay. Working overtime and without adequate support--just a typical American woman worker. En pointe. 'Nuf said! Brilliant! Thanks, Christie. I like short form poetry so I can make my point and step away. 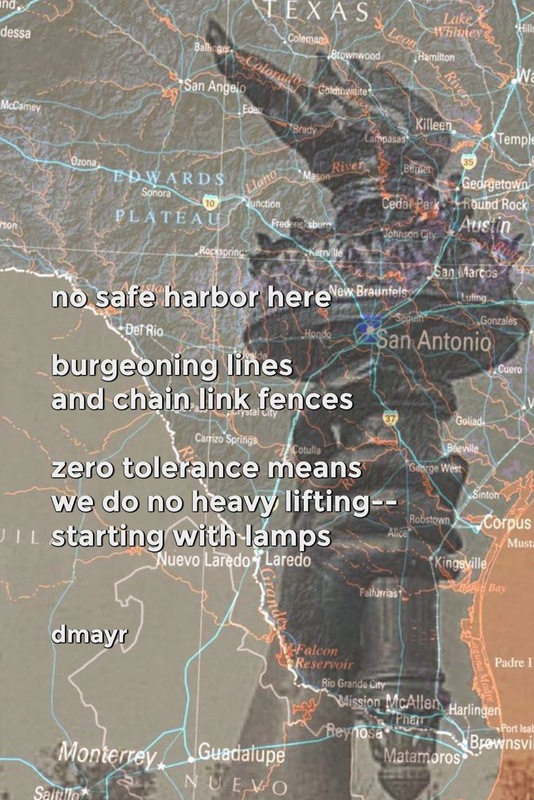 I love that your poems speak a louder truth the lies that currently fog our country's discourse--especially from the top. I keep hoping that he will go far enough that most everyone will see him for what he is, but I am afraid that too many people want to keep their eyes squeezed shut. 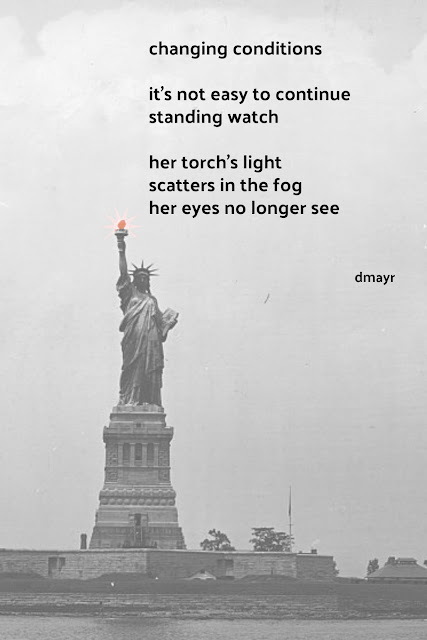 Diane, you nailed it in this series of Lady Liberty image poems, especially the last one. I hope her foundation is holding steadier than we are! Thanks for sharing this varied takes. It always makes me shake my head when people tell poets and authors that they should just focus on their art and stop being political. What a terrible lack of understanding, as if art hasn't always been political, used as means of expression and an instigator of change for centuries!